This all-inclusive luxury resort welcomes all ages to celebrate and enjoy time together. Connect when you want and disconnect when you need to. The Finest Suites are perfect for families, couples and friends who are looking for an extensive range of possibilities. Accommodations feature plush beds, oversize sofas, custom lighting to and deluxe bathrooms. An ever-changing activity list designed for keep both adults and kids engaged. 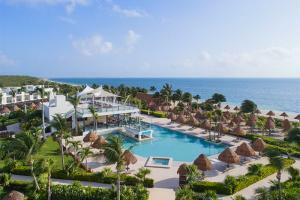 Finest Resort Playa Mujeres is gated, private and yet accessible. Cancun International Airport is just 25 minutes away and downtown Cancun is even closer. The Market Kitchen, Brass Steakhouse, Lobster House, Insieme Trattoria, Bistro, Tinto & Tapas, Lizo, Le Petit Plaisir. Parroquia de Cristo Resucitado, Playa Delfines, Dolphin Discovery, Avenida Kukulkan.